On the dunes at the south end of Ocean beach, towering above the Pacific Ocean, Fort Funston is one of the premiere dog hangouts on the Peninsula. As its name suggests this park was once a military outpost and two-gun battery that pointed seaward to protect mid-20th Century San Francisco from an attack. The remains of the battery are still intact and add a sense of martial history to the otherwise natural setting of sand dunes, eucalyptus groves and open beach. In addition to its draw for dog owners, Fort Funston is the main jumping off point for hang-gliders and parasailers who fly up and down the dune cliffs overlooking the beach. With its diversity of dune trails, open spaces and beach access, Fort Funston is the kind of place where you can pack a lunch and make a day of it with your dog. As you enter the park from the main parking lot and walk north, you’ll come across the first large open area to your left where there are usually dog packs forming and roaming. Anchoring this open area is a water fountain and dog bowls located where the main trail forks and descends north down the dunes. As you wind your way north, you’ll have various options to cut left and head down to the southern end of Ocean Beach. Once on the beach, head south and catch a trail back up the hill to the main parking lot. 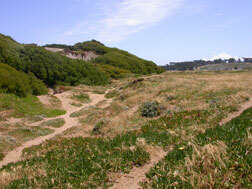 Fort Funston is located south of the San Francisco Zoo, across Highway 35 from Lake Merced. Take Highway 35 South from the city and exit on your right after John Muir Dr to reach Fort Funston’s main parking lot. While most dogs you see will be running free, the leash rule at Fort Funston has been in dispute for some time. Check the National Park Services’ page for current information about the leash rules. And as always, bring plenty of plastic bags to keep the park clean, and keep your dog under control at all times. See our “Dog Park Tips” page for more advice.